Savate vs. Kickboxing - Le Grand Tournoi 03th of June 2002. Zankifo won. Winner Alain Zankifo (savate)- finals of tournament called - Grand tournoi 2002. After karate and creation of American boxing - later called kickboxing, we saw also creation of Italian kickboxing called WAKO under boxing (FPI - AIBA) patronage. 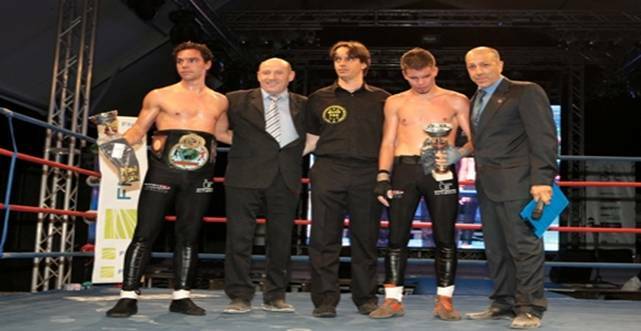 And now at this moment - FIKB - Italian kickboxing federation is not anymore experimental martial art federation of Italian boxing federation (FPI). 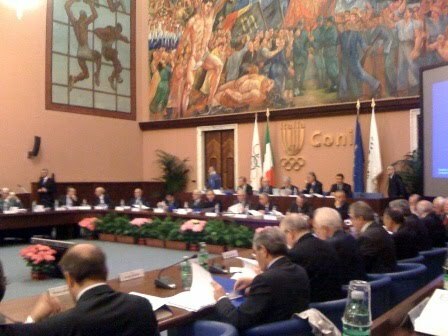 Now FIKB will be autonomous federation of different kicking + boxing sports. There are no specialised schools with MMA lessons, and the level of this "sport" is very low in Europe. But promotion from USA is a big deal. I agree. Technical advanced training course led by Ismalla SARR (Champion of FRANCE Elite A, European Champion, World champion) on April 10th, 2010 - club CSAHR (Rueil-Malmaison). The training course centred on the sequences of movements feet-fists or fists-feet, the centring, the feints and the defensive or offensive organization after a blow of stop mainly. This video groups includes the various worked exercises... said the author. In Ste Anne d'Auray, France. In a confusing and ambiguous world, nothing makes more sense than a good, old-fashioned sword fight. An object of great complexity, yet one with a singular use in mind - it is designed to kill. The word "sword" comes from the Old English sweord, cognate to Old High German swert, Middle Dutch swaert, Old Norse sverð and Old Frisian/Old Saxon swerd, from a Proto-Indo-European root *swer- "to wound, to cut". The Germanic peoples have manufactured and used metal bladed weapons from the Bronze Age onwards. The sword developed from the dagger when the construction of longer blades became possible. The early swords typically had long and slender shaped blades intended for thrusting. Later swords were broader and were both cutting and thrusting weapons. Swords from the Nordic Bronze Age from ca. the 13th century BCE show characteristic spiral patterns. The two swords found with the Nebra sky disc (ca. 1600 BCE) are shown to be a combination of Apa type swords and the Northern European Sögel type swords. Swords made of iron appear from the Early Iron Age, but do not become widespread before the 8th century BCE. Eventually smiths learned that by adding an amount of carbon in the iron, they could produce an improved alloy (now known as steel). By quenching and tempering, swords could be made that would suffer much less damage, and would spring back into shape if bent. Swords of the Migration Period show a transition from the various ancient Germanic sword types influenced by the Spatha, to the Viking sword types. The blade is normally smooth or shows a very shallow fuller, and often has multiple bands of pattern-welding within the central portion. The handles were often of perishable material and there are few surviving examples. Surviving examples of these Germanic Iron Age swords had blades measuring between 710 and 810 mm in length and 45 to 60 mm in width. These single handed weapons of war sported a tang only 100 to 130 mm long, and had very little taper in their blades ending in a usually rounded tip. During the Viking age, swords grew slightly in length to 930 mm and took on a slightly more acute distal taper and point. These blades had deep fullers running their length, yet still had single-handed hilts which often sported a lobed or cocked-hat style pommel. The fuller was used to increase the strength and flexibility of the sword while reducing the weight of the sword at the same time. This weight reduction and flexibility would allow the wielder to swing faster and harder strokes while, at the same time, allowing the sword to bend but not break when it hit bone. All over continental Europe between 700-1000 this design and its small variations could be found, evolving into the classical knightly sword with the emergence of larger crossguards. The arming sword is the single handed cruciform sword of the High Middle Ages, in common use between ca. 1000 and 1350. Typically used with a shield or buckler, the arming sword was the standard military sword of the knight until technological changes led to the rise of the longsword in the late 13th century. During the Late Middle Ages, the longsword had a position of honour among the European martial disciplines. There are no known manuals predating the Late Middle Ages (except for fragmentary instructions), although Ancient and Medieval literature (e.g. Icelandic sagas and Middle High German epics) record specific martial deeds and military knowledge; in addition, historical artwork depicts combat and weaponry (e.g. the Bayeux tapestry, the Morgan Bible). The central figure of late Medieval martial arts, at least in Germany, is Johannes Liechtenauer. Though no manuscript written by him is known to survive, his teachings were first recorded in the late 14th century MS 3227a. From the 15th century into the 17th, numerous Fechtbücher (German "fencing-books") were produced, of which some 55 are extant; a great many of these describe methods descended from Liechtenauer's. At the beggining they were shy to do it like in boxe francaise trainings, but these days we see how compatible Canne de combat and Boxe Francaise are. And - historical fencing just try to follow our development. Old fashioned way. Very attractive. 2nd of May 2010 - kids. See Branko Cikatic in action and the damage that is caused with bigger gloves (JKD gloves) than MMA gloves we know today. If you don't see big MMA lies, than you are blind. WTF President Chungwon Choue attended the meeting. The WTF, the world's taekwondo governing, became an associate member of the IMGA at its General Assembly meeting during the 2009 Denver SportAccord. "We are happy to announce that taekwondo has been put on the official program of the Masters Games starting with the 2013 European Masters Games," said IMGA CEO Holm. "Given taekwondo's high educational aspect and popularity around the world, taekwondo's inclusion in the Masters Games will create a high synergetic effect on both the WTF and the IMGA." WTF President Choue said, "Poomsae's inclusion in the Masters Games will further promote taekwondo, especially poomsae. For the WTF, it is another feat following poomsae's inclusion in the 2017 Universiade and the 2013 Mediterranean Games." With the IMGA's decision, taekwondo practitioners of over 41 years of age can attend the taekwondo competition of the Masters Games. The IMGA follows the rules of International Federations regarding the age category of participating athletes. Messaoudi Farid vs. Carbone Richard - Quarter Finals - France Elite Championship - Savate Boxe Francaise. 21th of March 2009 - Romainville, France. Carbone in Italian or French team? 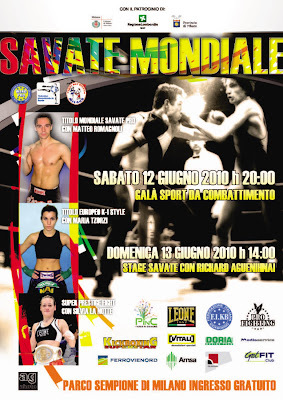 video promo for Silvia La Notte (kick boxing world champion) - directed by Mohamed Bashir - produced by New Vision communication Milano - cameraman giacomo cracco - theme by massive attack - Emi records.